Babajide Sanwo-Olu the controversial new entrant of the Lagos State All Progressives Congress (APC) governorship race, yesterday opened up on his aspiration, saying it has nothing to do with Asiwaju Bola Ahmed Tinubu, but taking Lagos to the next level. 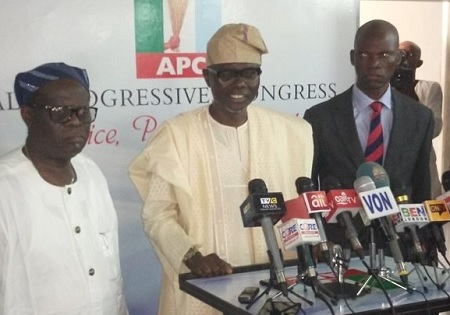 Speaking with reporters at the APC national secretariat in Abuja after submitting his nomination form, Sanwo-Olu, who is widely referred to as the anointed aspirant of the former Lagos State governor, is confident that the state will be better off with him as governor. He said as a three-time commissioner, two-time special adviser and head of the biggest corporation in the state, he has the experience to run the state. His words: “There is no doubt that things will be said here and there. I am a full grown man with several years of experience. Like I said, it is about the Lagos of our dream and the Lagos that we want to take to the next level and so, it has absolutely nothing to do with our leader. “There is no denying the fact that he has been our national leader and he plays that role not only in the state, but at the national level. He has interest in the improvement and wellbeing of the Nigerian dream. On the supposed controversy generated by his entrance into the race, Sanwo-Olu said “the truth is that I’m not in Ambode’s shoes right now and what has been generated is a reflection of the fact that people have come to understand and know the kind of person that I am. “A whole lot of us had to redefine the Lagos project. This is not the forum where I will begin to roll out to you the very many first that people think were done by some other individuals, but there were other people behind them that brought out those ideas, policies and implementation plan. “There are so many firsts that I can begin to attribute to myself in the 11 years that I have had to do in the public service. Like I said, I have served three different governors and in three different ministries, served twice in the Governor’s Office, headed the biggest agency of government. Asked why he is contesting now, Sanwo-Olu said: “I am someone that is over 50 years old. In fact, I am 53 years old. More importantly, in the last 30 years, I have spent 16 years in the private sector and 11 in the public sector. I have been three-time commissioner, two-time special adviser. I have been managing director of the biggest corporation in the state and has served about three governors. “So, I have had a dream to obviously contribute more as a Lagosian, as a son of the soil and just to let our people get to the level where they know that governance is all about people, what they expect and what you throw back to them to them to improve the cost of living and security of lives. The aspirant would not be drawn into endorsement and a supposed stakeholders meeting saying: “I am in Abuja now and certainly cannot know what is happening in Lagos. You are in the media and so have access to information that I don’t have. When I get to Lagos and there is a meeting called by the leadership, I will attend the meeting. “But in terms of endorsement, it is a work in progress. People have been asking questions, wanting to know the type of person that I am. I certainly will never say it is hurray because it is a journey and not a destination. “It will be very presumptious of me to stand before you and begin to imagine that 57 chairmen have endorsed me. That mean I am going to sleep. That will not be so.